Compatible with most iOS and Android smartphones, including models from Apple, Samsung, and more, the 6-in-1 Smartphone Lens Kit from Avoda is a manufacturer's bundle that includes a 2-in-1 0.63x wide-angle lens and 15x macro lens, a fisheye lens with a 198° angle of view, a 2x telephoto lens, a kaleidoscope lens, and a circular polarizing lens (CPL). Each lens has been multi-coated to help reduce glare and ghosting, and attaches to your smartphone using an included clip-on lens attachment. Also included is a portable carrying case and a cleaning cloth. 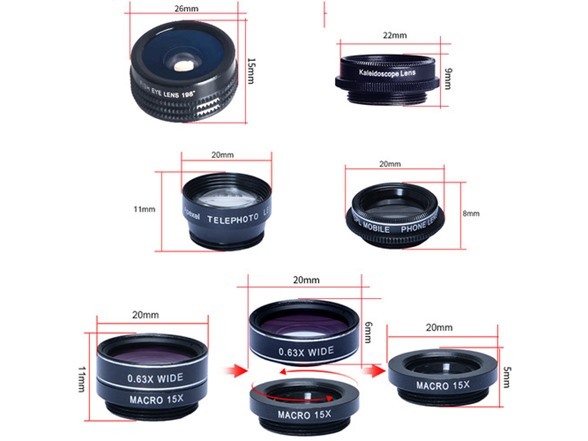 Please ensure that when attaching one of these lenses to your phone, it is placed directly in front of your phone's lens to avoid blurry images. The fisheye lens can capture a 198° field of view, which produces images with a unique perspective. The telephoto lens has a magnification of 2x and can capture images from further away. The circular polarizer filters polarized light to reduce reflections, enhance colors, and increase contrast to make images clearer. The kaleidoscope lens produces overlapping images. The wide-angle and macro lenses arrive screwed together for easy storage. 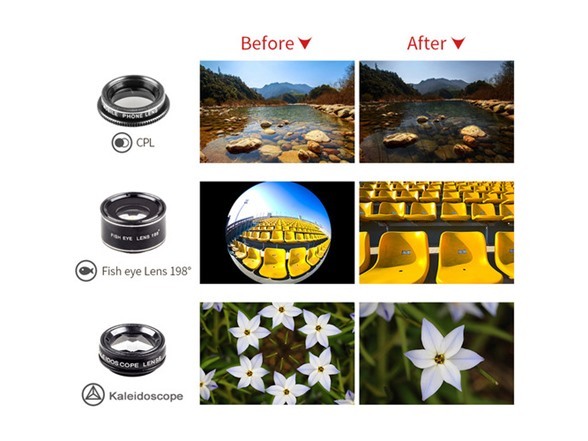 To use the wide-angle lens, simply attach both lenses to the clip that is provided. 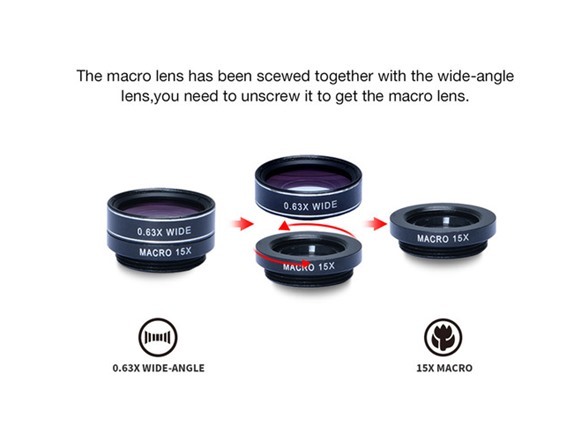 To use the macro lens, simply unscrew the wide-angle lens. Make sure you keep each lens clean with the included cleaning cloth. 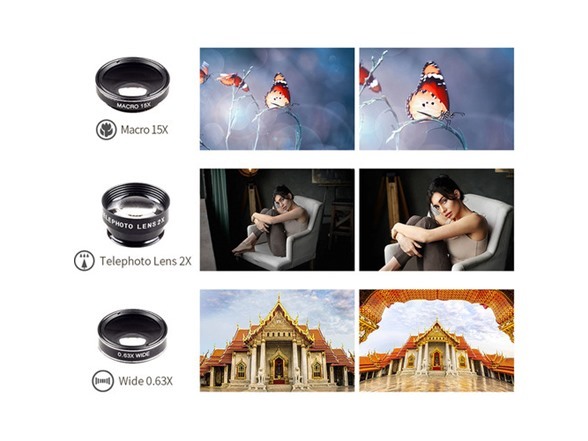 The 0.63x wide-angle lens is suitable for shots including panoramas, group shots, and architecture, while the 15x macro lens can take clear photos of small objects between 0.4 to 0.9" / 10 to 23mm away.